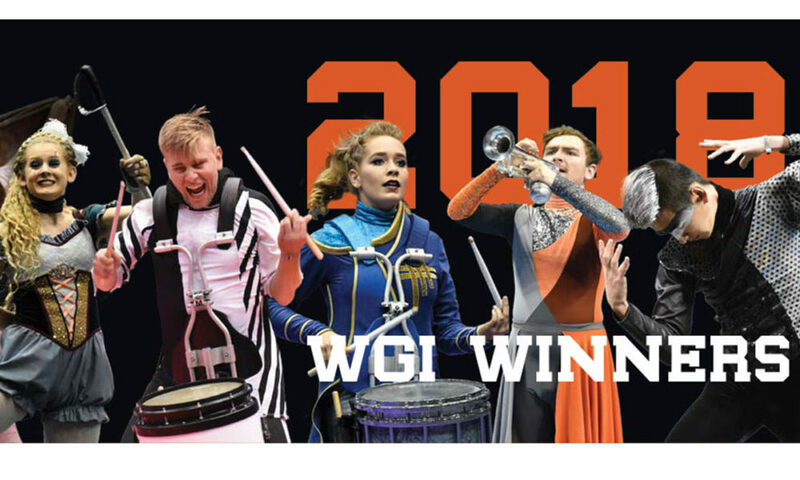 The 2018 WGI gold medalists tackled many dark subjects including isolation, suicide, and war. At the same time, they showcased unique lighting and color as well as memorable costumes. 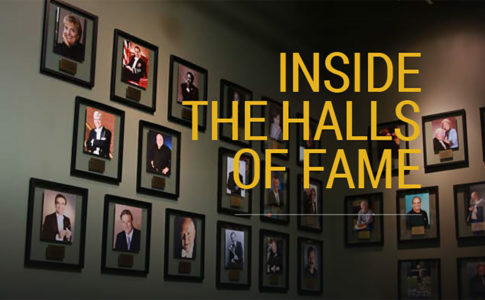 Enjoy this 11th annual feature. 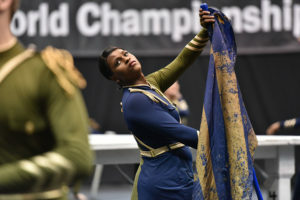 To Describe You …: With costumes that included stretchable pieces from the arms, around the neck, or down the back or torso, Paramount Winterguard surmounted the competition to claim first place in Guard Independent World. The group explored the concept of individuality by using depth and contour. The show incorporated large printed fabric pieces that members hid behind or emerged from as well as a tripod-like sculpture that performers hung from, moved, lay on, or climbed. Its soundtrack comprised Nico Muhly’s “Describe You,” Kronos Quartet’s “Pieces of Africa,” and rhythmic and soundscape material by Vince Oliver. 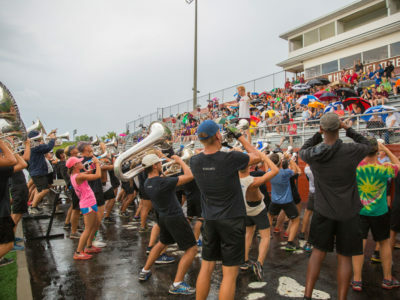 Last year’s champion Pride of Cincinnati finished second with a score of 96.600 while Blessed Sacrament from Cambridge, Massachusetts, achieved third with a score of 95.900. 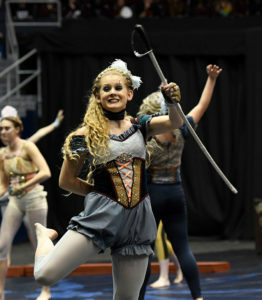 The Forgotten Circus: Avon High School’s winter guard group paid tribute to the bygone circus era with a nostalgic program that emerged as the greatest show in Guard Scholastic World. Though forlorn in tone using Clint Eastwood’s “End Title” instrumental music, the show also incorporated the thrill of a three-ring circus with a ringmaster, muscle man, clowns, and fittingly some knife/sabre throwers. Costuming showed dazzling details as well as muted tones. 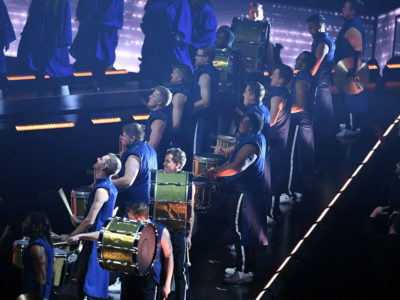 The show also incorporated poles that represented cages and large travel trunks with hidden back doors that allowed members to appear mysteriously from the top. 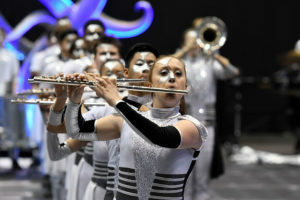 With a score of 95.950, Trumbull (Connecticut) High School received the honor of second place while Carmel (Indiana) High School followed closely in third place with a score of 95.850. 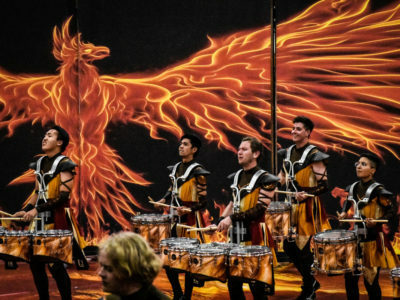 Listen: RCC Indoor Percussion won its sixth title in Percussion Independent World by urging audience members to join its creative space and explore the progress of life, love, and art through the poetry of Charlie Schmidt. 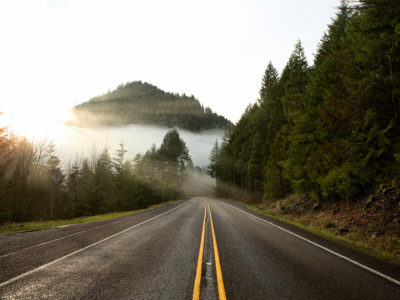 “Progress sounds like the rhythm of change,” as stated in the show. The program incorporated a trumpet soloist and showcased paintings and props that illustrated past RCC shows. Its black-and-white costuming served as a stark contrast to the mostly red tarp. Music included “Orange Market” by Lars Danielsson, “With or Without You” by U2, and original music by Jim Wunderlich and Sean Vega. 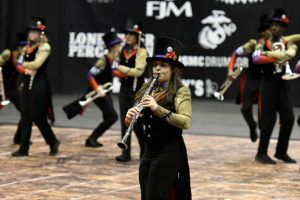 Rhythm X from Dayton, Ohio, finished in second place with a score of 97.513 with Broken City from Lake Elsinore, California, in a close third with a score of 97.500. Seek and You Shall Find: For the second year in a row and its fifth time overall, Chino Hills High School found itself at the top of Percussion Scholastic World competition—this time with a record-breaking score. Its show navigated unfamiliar territory with members dressed to look like Naval officers using lanterns to light the way. Near the beginning of the performance, members pushed large silver sails as well as a drumset on a moving platform to simulate a boat moving out from the shore. Throughout the show, silver and purple silks simulated flowing waters and covered the performers for visual transitions between scenes. 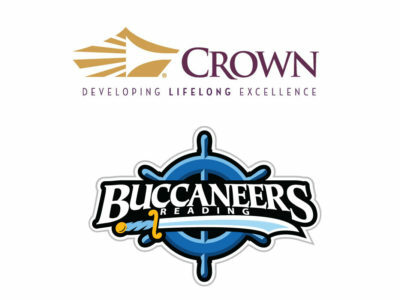 Dartmouth (Massachusetts) High School and Arcadia (California) High School finished second and third with scores of 97.188 and 96.338 respectively. With a Twist: Judges and fans have definitely caught wind of the excellence embodied by Rhythm X as the group claimed its third title in Winds Independent World during the four years of the category’s existence. Its patterned floor and long skirted uniforms helped accent the members’ whirlwind of activity during the show. The performance also explored various instrumental arrangements with a small but mighty front ensemble, brass feature, upbeat woodwinds combo, and flute solo. Crossmen from San Antonio ended the competition in second place with a score of 92.975 while STRYKE Wynds from West Palm Beach, Florida, finished in third place with a score of 92.550. Innoventions: Flanagan High School’s technical skills shone in its 2018 show, which launched the group to win the Winds Scholastic World title. 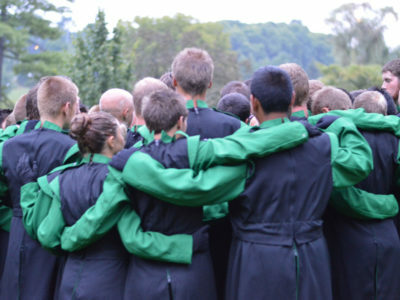 For the last two years, the group finished second in the Winds Scholastic Open category. Members wore black and silver costumes with masked eyes created by black and silver makeup. Many of the performers had silver streaks in their hair for an extra flash of light. The show’s set included staircases and risers to feature specific performers. Greenfield (Indiana) Central High School finished closely behind in second place with a score of 94.750 while Cleveland High School in Clayton, North Carolina, rounded out third with a score of 91.000. 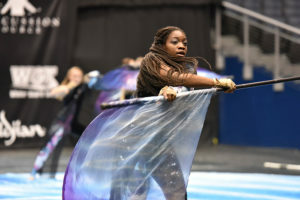 Sit Down: For its Open Class show, UCF Pegasus was at war with itself but definitely made peace with the audience and judges to capture its second championship in Guard Independent Open. With military-style uniforms split between navy on the right and olive green on the left, the guard members represented two opposing sides and started the show with a prolonged rifle feature. A large white table in the middle of the floor symbolized the negotiating space that members performed around, on top of, and underneath. 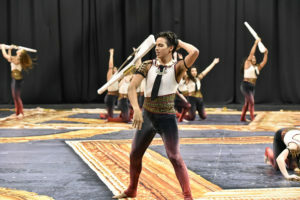 Color Guard Theatre (CGT) Denton (Texas) scored 96.900 for a second-place finish while The Brigadiers from Syracuse, New York, received the third-place award with a score of 95.600. 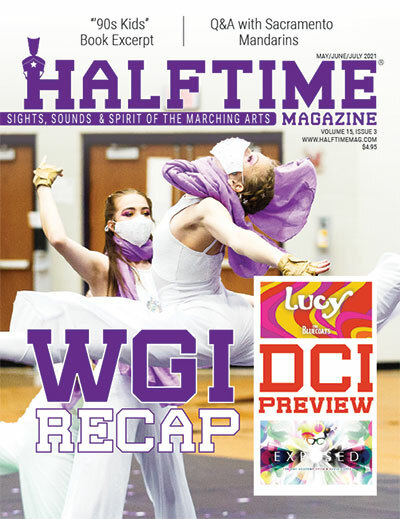 Break the Silence: Park Vista spoke loud and clear with its winter guard show about the importance for young adults to express their opinions and emotions, earning the group the gold medal in Guard Scholastic Open. Members started the program with their mouths covered with black X’s and ended it in a united voice to “never again” be silenced. 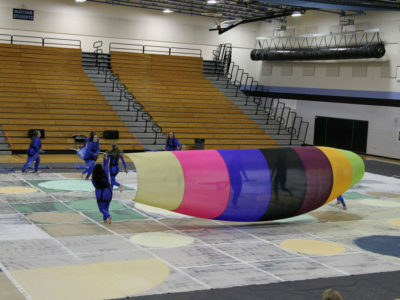 Visually, the program used several small circular tarps, which were black on one side to blend into the floor and then unfolded to reveal sound waves. 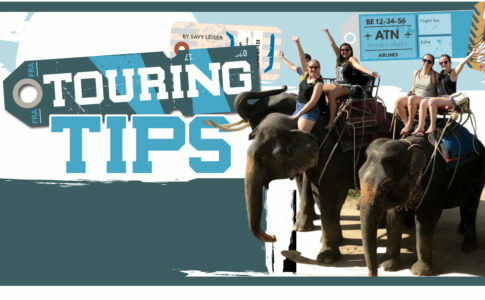 The program featured two songs titled “Break the Silence” as well as the spoken poem “Somewhere in America” by Get Lit. Silver medalist Plymouth-Canton (Michigan) Educational Park had a score of 95.450 while El Dorado High School from Placentia, California, received bronze with a score of 94.600. 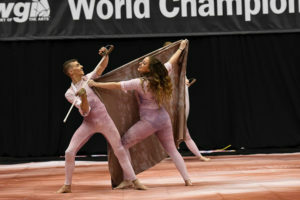 Unsteady: Focused on teen depression and suicide, Matrix Open’s show also brought hope that “none of us are alone.” For its emotional program that included the use of balance beams, the group earned the gold medal in Percussion Independent Open. Costumes were two-toned: gray on one side to show despair, and maroon on the other side with highlighted numbers from the teen suicide hotline. 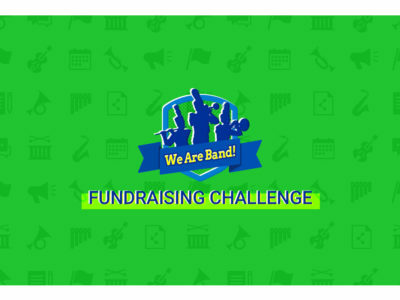 Musicians performed an arrangement of “Unsteady” by the X Ambassadors, “Heavy” by Linkin Park, and “1-800-273-8255” (the national suicide hotline) by Logic. Spirit Winter Percussion from Orleans, Massachusetts, placed second with a score of 95.363 while Infinity 2 from Orlando, Florida, finished third with a score of 95.313. 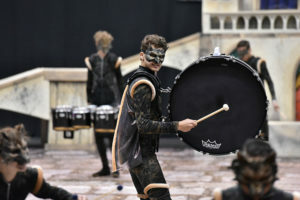 Set in Stone: In its indoor percussion show, Clear Brook High School humanized gargoyles that guarded an ancient cathedral, leading to a first-place finish in Percussion Scholastic Open. 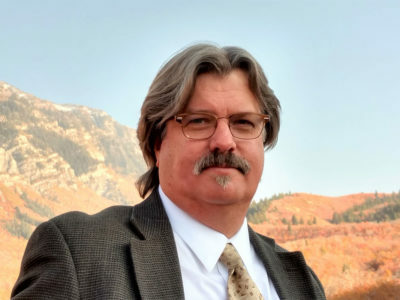 The original composition by Bryan Harmsen included sounds of rain, wind, and crumbling stone layered over Gothic organ samples at the start of the program to exude a feeling of isolation while a female vocalist later provided contrast and warmth. The show’s backdrop consisted of a giant cathedral with nine stained-glass windows that lit up. In the end, the curse on the gargoyles was lifted as they were released from their lives of stone. 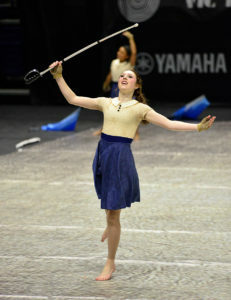 Old Bridge (New Jersey) High School received a score of 95.475 to finish in second place while Victor J. Andrew High School from Tinley Park, Illinois, had a score of 94.525 for third place. The Barber: Inspired by the Broadway musical “Sweeney Todd,” Azle High School’s winds program told a new tale of a barber who eventually killed his lover. 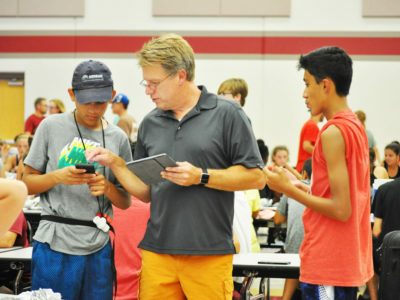 The program included a trombone barbershop quartet as well as music from both “Sweeney Todd” and “The Barber of Seville,” earning the group the Winds Scholastic Open championship. In a difficult musical maneuver, the musicians kept pulse without any percussionists. The set included a barbershop storefront and chairs. Mill Creek High School from Hoschton, Georgia, completed the season in second place with a score of 91.475 while Edinburg (Texas) North High School earned a score of 90.725 for third place. 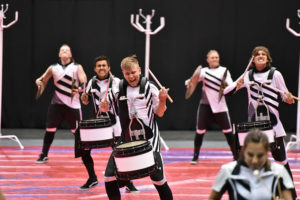 A Chair for Mom: Shortly before Mother’s Day, Pacificaires paid tribute to a mother’s love in its Guard Independent A championship-winning show. The performance used the musical selection “If This Old Rocking Chair Could Talk,” which included spoken word, and a single wooden rocking chair as a prop. The story followed a mom with her newborn who grew up to then rock her own child in the chair. Black Gold A from Dallas/Ft. 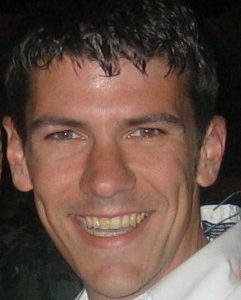 Worth, with a score of 95.445, finished in second place. James Madison University Nuance Winterguard from Harrisonburg, Virginia, followed closely behind with a score of 95.410 for third place. Reflections: Leander High School winter guard was destined for gold in glittery uniforms and with gilded mirror frames depicted on its tarp. 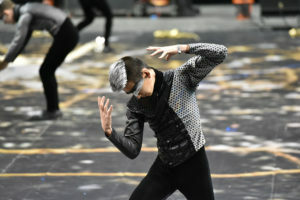 Performing to Michael Jackson’s “Man in the Mirror,” Leander proved that change and success starts by looking within as the group captured the Guard Scholastic A championship. Going into the flag ensemble, the group rocked out to a dance remix version of the song arranged by the school’s percussion director, Mike Zellers. In a dramatic moment, the full ensemble stopped to bring focus to a solo rifle toss that left the audience dazzled. Marian Catholic High School from Chicago Heights, Illinois, took home the silver medal with a score of 96.880 while Decatur Central High School from Indianapolis received bronze with a score of 96.460. 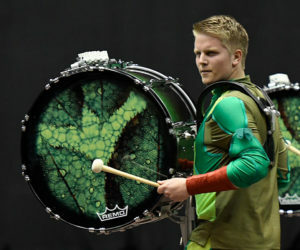 Into a Rose: In only its fourth season of existence and third season of competition, IMPACT Percussion made a big impression at its first world championship, winning the gold medal in Percussion Independent A. With a dark tarp to symbolize the earth, green costumes that resembled flower stems, and screens in the background that showed leaves and then blooming flowers, IMPACT showcased the blossoming life of roses to explore the concepts of self-discovery, inner potential, and growth. Music included “Kiss from A Rose” by Seal and original content from arranger/designer Matt Hahn. Unity Percussion from Gainesville, Florida, completed the season in second place with a score of 92.375 while Florida International University (FIU) Indoor Percussion from Miami rounded out third with a score of 92.313. 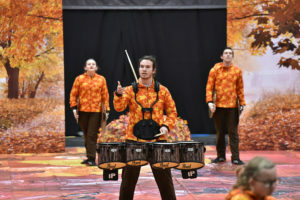 Fall: Plainfield High School rose to the challenge, achieving first place in Percussion Scholastic A competition with its show titled “Fall.” Exploring multiple meanings of the word from the season to the action, Plainfield’s program incorporated falling leaves and a trust fall. Its tarp, backdrops, and costumes added to the autumn motif. Toward the end of the show, members took off their jackets to reveal printed snowflakes on their uniforms and threw white confetti in the air to simulate falling snow. Musical selections included “Autumn Leaves” by Ed Sheeran, “Fallin’” by Alicia Keys, and “Fall” by Chloe x Halle. 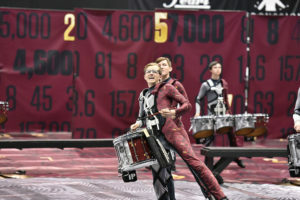 Irondale High School in New Brighton, Minnesota, received a score of 94.675 for second place while Dorman High School from Roebuck, South Carolina, took third place with a score of 94.638. Chrome X: Valley Christian continued to explore color and lighting to win its second Winds A title—now as an Independent group as opposed to a Scholastic team in the past. 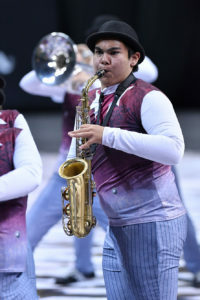 Last year, the group featured the shades of night while this year the ensemble reflected various colors against its mostly colorless white and chrome uniforms, floor, and flags. Its song selections—“Mayhem” by Daniel Montoya Jr. and “Dance Movements” by Philip Sparke—presented angular harmonic rhythm and action. Metal stairs and large swirly sculptures comprised the set. 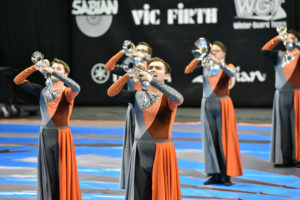 Inertia Independent Winds from Plain City, Ohio, finished in second place with a score of 88.800 while LakeShoremen (LSM) Winds from Downriver, Michigan, had a score of 85.225 for third place. City Trees: Set in a park with trees, streetlamps, a bench, and a garbage receptacle, Lake Hamilton High School’s winds program proved that community connection is important as it won both the Fan Favorite and gold medal for Winds Scholastic A. 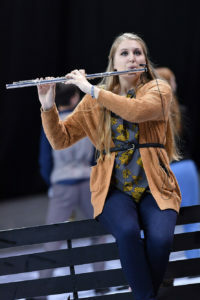 With each performer uniquely clad and representing “leaves fallen from the tree of society,” the show started with just a flute and guitar duet. In the end, the characters realized that they all needed each other. Musical selections comprised “A Kaleidoscope of Mathematics” by James Horner, “Symphonic Requiem” by James Barnes, and “City Trees” by Michael Markowski. 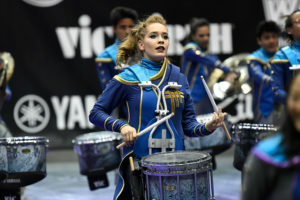 Newnan (Georgia) High School ended competition in second place with a score of 92.575 while Daviess County High School in Owensboro, Kentucky, finished in third place with a score of 88.975.